Escape in Violet, a private luxury Mykonos Villa, away from the buzz of the town. Located in Kanalia, in the southern part of the island, it is the perfect destination for the family vacation for 10 adults and 4 children. Enjoy the tranquility and the superb view by getting sunkissed by the pool or reading a book in the shaded pergola. Relax in the huge outdoor area in the cozy sofas and loungers. The distinguished Greek architectsthat created the villa took care of your privacy. You can plunge into the sea through a flight of stairs. 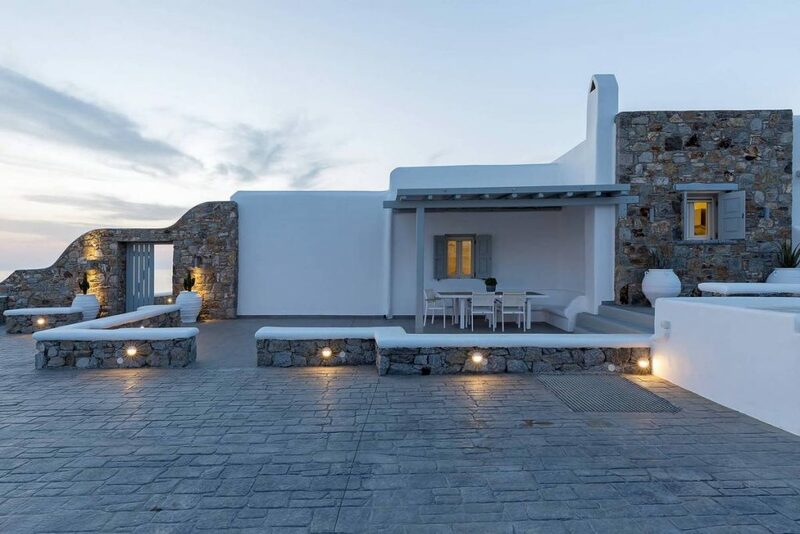 The modern design of wood and stone merges with the Cycladic architecture. Art lovers will be thrilled with the great wall paintings as well. Thinking about hosting an event? We have your backs with two dining areas, a big barbecue and amazing pool terrace that can seat 40 guests. Pro tip: Ask for a traditional Greek meal cooked by our best chefs! Our award-winning concierge team can arrange it for you in no time!